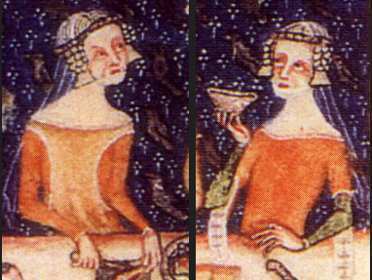 Admit it: one doesn’t really expect medieval ladies to have names like Felicia or Joyce. They sound way too modern, don’t they? And yet today we will spend some time with two ladies with these names. Joyce was the mother of Felicia, but due to events I think we can safely say that there was little love lost between mother and daughter. After all, the mother was more than eager to help hubby number two cheat her daughter out of her inheritance. Not, IMO, nice. Felicia likely agreed. Joyce, however, would say she was but doing what any good wife and mother would do in the 12th century: furthering the interests of her son. If we start at the beginning, we have to go back to the tumultuous year 1264. England was an unsafe and dangerous place. 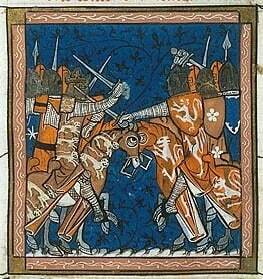 Simon de Montfort had more or less ousted Henry III from his throne (in practice if not formally) and the country was divided. On the one side were those who held with de Montfort and his demands that the people (as defined by Montfort, i.e. we’re not talking about universal suffrage here) be given a voice in how they were ruled. On the other, the king (albeit speaking from a position of weakness) the king’s son, Prince Edward, and those who held true to them. Some men dithered. One moment they supported Montfort, the other they were back to upholding the natural order of things, i.e. the king. 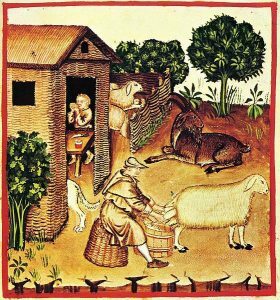 Among the more famous ditherers are Richard de Clare and his hot-headed son Gilbert the Red. But they have no bearing whatsoever on today’s story so let’s just skip all this. Instead, allow me to introduce William Whelton. Here, dear reader, we have a man of some local influence. You see, William was the proud owner of FOUR manors in Northamptonshire and was therefore considered quite the wealthy man. But William, like almost everyone else who owned land at the time, had a bit of a problem: what side to support, de Montfort or the king? In William’s region, the flamboyant Earl of Leicester threw the longest shadow and to stand in opposition against de Montfort while surrounded by his allies would likely have resulted in a very short lifespan. Plus, it is probable William agreed with the Provisions of Oxford—even saw Simon as something of a refreshing counterbalance to the weak king, so dominated by his French half-siblings and his wife’s Savoyard kinsmen. To choose wrongly came at a price. Whoever ended up on the losing side could say bye-bye to whatever manors they might have had. This may be the reason behind William’s decision regarding his manor at Whilton. Maybe he was hoping to safeguard something for the future by granting the manor to his second son. 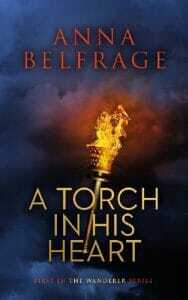 Or maybe it was as simple as William wanting Nicholas de Whelton to have his own land and by granting him the manor in his own lifetime he could bypass the laws of inheritance that would otherwise have seen all his belongings pass to his eldest son. To ensure his second son had property was also a way to facilitate Nicholas’ search for a bride. At the time, Nicholas had found a bride and as Joyce la Zouche came with nice jointure I imagine her father would have insisted on Nicholas having something to his name so as to safeguard Joyce’s future dower income should Nicholas predecease her. In 1264 William undertook a number of actions whereby he transferred ownership of Whilton to Nicholas. In return, Nicholas granted William full rights of usage for the rest of William’s life, i.e. any incomes deriving from the manor would still end up in William’s purse. But formally the manor would belong to Nicholas. Well, it would do once Nicholas had taken seisin of it. To take possession of land—delivery of seisin—was a rather formal affair. Not so that it required a lot of written documentation. No, delivery of seisin was all about actively doing a number of things. First of all, William had to visibly transfer ownership. This was done by a ritual whereby William led Nicholas up to the main entrance of the manor and placed his hand on the door hasp, thereby “giving” him the door and all the contents within. Then he presented Nicholas with a branch of a fruit tree to show that Nicholas now had the right to make use of everything that grew on the manor. Finally, once he’d done this, William waved “bye-bye” to his son (and Joyce, one presumes) and left Nicholas to formally take possession. Taking possession in this case meant Nicholas remained at Whilton for two weeks or so, very much behaving like the lord of the manor. 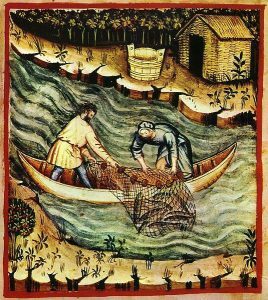 He burned wood, he took oaths of fealty from the tenants and did some fishing—all of this to show he was entitled to use the land as he saw fit. Two weeks later, William returned and now it was Nicholas’ turn to grant the manor back to his father for life. After all this seisin stuff the manor was formally Nicholas’ and once William was dead the full use of the manor would revert to Nicholas, not to big brother Roger who, according to the laws of primogeniture that were applied to everything to do with land, otherwise would inherit. As an aside, it is interesting to note that William could never have written a will in which he left one of his manors to Nicholas as this would never have been recognised as a valid transfer of land, not when there was an older brother. But gifting land in your own lifetime was okay. Anyway: to really seal the deal William then persuaded his eldest son Roger de Whelton to sign a quitclaim, a document in which he accepted his father’s gift to his younger brother. After all this, Nicholas was now safely in possession of Whilton—well, so one would think. In August of 1265, Simon de Montfort was killed at Evesham and all those fighting for him were branded rebels, their lands forfeited. William and his sons had been fighting for Simon and so the de Whelton family suddenly found themselves without any manors at all. A most dire situation and had it not been for the fact that they were not exactly alone—many, many were the men of noble birth who were suddenly rendered destitute, thereby becoming a potentially dangerous and destabilising influence on society—this story would have ended there. However, eager to bring peace and stability to his realm, King Henry approved the Dictum of Kenilworth. This allowed for the rebels to buy back their lands with a hefty fine. Yes, things would be tight for some years, but most who could leapt at the opportunity. So did those who did not have the money at the ready but hoped to somehow finance the repurchase of their hereditary lands. Among them was William. Not among them was Nicholas, who had sadly passed away, leaving a young widow and a very young daughter. Oh, dear. Suddenly, gifting Whilton to Nicholas appeared a very, very bad idea. William never expected his son to die that young—or to leave an infant girl as his heir. This was all very bad for the de Whelton family as Nicholas’ widow, Joyce, could claim a third of the income from the manor for life. And as to baby Felicia, well she was now the ward of William’s overlord (although the lord in this case was a lady) and her two-thirds of the income would end up in the hands of said lord. Instead of setting his son up for life, William had managed to lose control over 25% of his total income. If we’re going to be correct, at the time Whilton was still under attainder as William had not managed to raise the money to cover the fine. This, however, was just a temporary setback. The gifting of Whilton was a much more permanent setback. The future prosperity of the de Whelton family now depended on whether the gift was valid yes or no. Joan de Stuteville was the overlord of Whilton and thereby automatically became Felicia’s guardian. The baby was whisked away to be raised in Joan’s household and Joyce returned to her father, there to prepare for her next marriage. She was young, she was fertile, and in possession of an annual income of 8 pounds or so from Whilton—assuming the gifting of the manor to Nicholas was considered legal. Joan de Stuteville was all for upholding the gift. After all, this gave her access to Felicia’s inheritance for well over a decade. In all this upheaval, William de Whelton died, still without having paid the fine. It fell to his eldest son, Roger, to finalise these matters. Roger was short of money and when Joyce’s father approached him with a plan, he therefore listened. William la Zouche was a powerful man determined to do his best for his recently widowed daughter. In this case this meant negotiating a good second marriage for her and to do so it would help if Joyce brought a nice chunk of property to her new husband. La Zouche’s plan was easy: Roger was to claim his father’s grant to Nicholas was invalid. Thereby, Whilton reverted to Roger. La Zouche would lend him the money Roger required to pay the fine and in turn Roger would name William la Zouche his heir for Whilton—and for his other three manors. Effectively, la Zouche was cheating little Felicia out of her inheritance to boost his daughter’s marital prospects. He sugar-coated the offer by throwing in some land which would pass from Roger to “heirs of his body.” If no such heirs existed, this land would revert to la Zouche. All very complicated, isn’t it? The end result was that Joyce became quite the catch. She’d bring four manors to her future husband rather than a paltry eight pounds a year. Roger would be able to pay the fine, end up with some land and have use of the manors for his life. Felicia would be left disinherited and dependent on the goodwill of her relatives. In view of how they were all acting—her maternal grandfather, her paternal uncle, even her mother—this was not a good thing for Felicia. One major hurdle remained for Roger. He had to prove his father’s grant of Whilton was invalid. To do so, he examined just what decisions Nicholas took during those fifteen days in which he’d been in possession of Whilton prior to re-granting it to William. Turns out burning wood and taking oaths was not enough. Nicholas should have ordered a field to be ploughed or had a pig slaughtered or fired the bailiff. Nicholas did none of this. Had he lived it would never have mattered. Now, however, he was as dead as a rock and the one paying the price for his ploughing negligence was his little daughter. For years, the dispute was brought before various assizes and courts. The fact that Roger had signed a quitclaim was neither here nor there. Unless Nicholas had properly taken possession, the document was irrelevant. For years, Felicia’s guardian defended the rights of her ward against Felicia’s family and stepfather. In 1273, Joyce remarried. Her new groom was Robert de Mortimer and he was determined to see his wife recognised as heir to those four manors. After all, he hoped she would give him a son, a boy to inherit those nice, fat livings. At the time, Felicia (well, her guardian, seeing as Felicia was at most eight) was in possession of Whilton. Some months later, her representatives were ejected by the Mortimers who now claimed they had seisin of the manor. Once again, the case was dragged before the assizes. One judge gave Felicia the right of it, another ruled in Joyce’s favour. Somewhere along the lines this had become a mother-daughter feud, something which must have soured their relationship permanently. 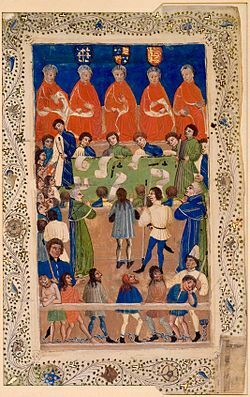 Back and forth went the rulings until, in 1280, the courts handed down a “final” verdict: Robert de Mortimer and his wife Joyce were to be considered rightful owner of Whilton. 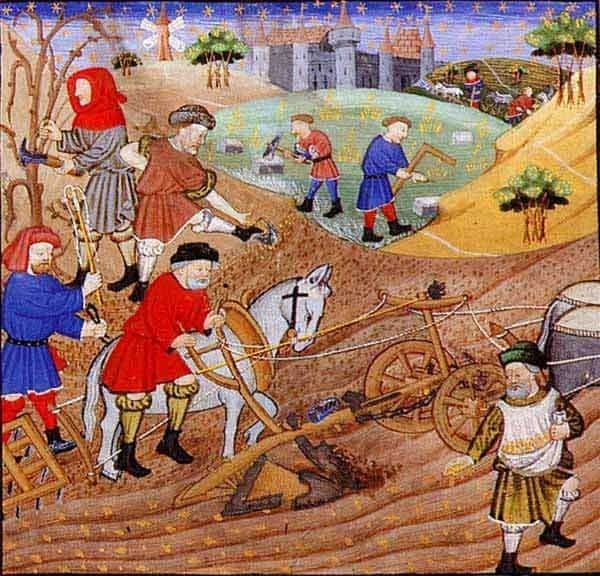 Felicia had lost it all: her father, her lands and, one assumes, her mother—and all because her father had been somewhat remiss in his ploughing. Things did not end here. Once Felicia married, her husband was as determined as de Mortimer to get his hands on Whilton. What then followed is probably the longest ever land dispute in English history, stretching all the way to 1380. Along the way a wife would poison her husband, cousins would marry cousins and one judge after the other would be presented with a case where the stack of documents grew into a huge tottering pile. How it all ended? Well, I am happy to report Felicia’s descendants won out—but that, I think, is the subject for a future post. That was so enlightening! I never knew about the “taking possession” angle. Thanks for posting!